Q: Add button to the PDF flip book? PDF to FlashBook has more features than you can imagine. You can do many things base on the original PDF file, including adding buttons on it. It’s similar to adding links, but when the link is not about the sentences, you may choose a button, we offer you more choices. This convenient feature can put the button to any situation on your flash flipping book. Now let’s get started! Step1: Click “Edit Pages” to show a new window. Step2: Click “Add Button” , then choose an area for the button. You can change its size and situation. Step3: Customize the button with the right little window. 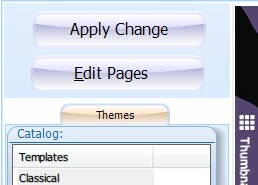 Step4: Save or Save and exit to return to the main interface, apply these changes and check the buttons out.